When Mary moved to Charlotte, NC a few years ago, she wasn’t sure how to make new friends in a new city. “So I used my blog as an excuse,” she explains. She started reaching out to food bloggers on Twitter and asking them to have lunch with her. Shortly after moving, her birthday lunch consisted of herself and five gals she’d never met before; Twitter-solicited birthday-lunch dates. “That’s just one small example of how incredible the food blogging community is — it doesn’t matter who you are or where you came from. If you love food, you’ve got a friend in a food blogger,” Mary shares. Now, Mary’s the relatively newcomer to Columbus (she moved here last May). “When I got here, I followed the same game plan I used in Charlotte: reaching out to food bloggers on social media and asking them to lunch,” she explains. And guess what? They all said yes. 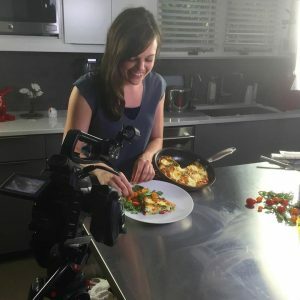 As Mary met more and more people, she realized there wasn’t a central place for food-focused bloggers and influencers to connect in Columbus. Each person she met agreed with her. But there was problem – everyone’s plate was too full and no one wanted to take on this sort of project. But Mary says, “although I was the newbie in town, I started working on the foundation to form the group.” She crafted a mission statement, membership requirements, website, social media accounts, launch survey… the list goes on. Eventually, Mary recruited a few community leaders to help with the behind-the-scenes administrative business, and Cbus Food Bloggers officially launched in December 2016. You can learn more about Mary Cowx and Fervent Foodie by visiting her online at www.ferventfoodie.com. And be sure to visit Cbus Food Bloggers online at www.cbusfoodbloggers.com + read our spotlight on #CbusFoodBloggers and its Community Leaders by clicking here.